Unique Wood Mask from Indonesia, "Life's Ups and Downs"
This elegant mask encloses two expressions as Eka explores the ups and downs of life. Carved by hand of hibiscus wood, the face can be displayed with a smile or with an expression of sorrow. Hibiscus wood varies widely in its tones and patterns, thus each mask is an absolutely unique work of art. 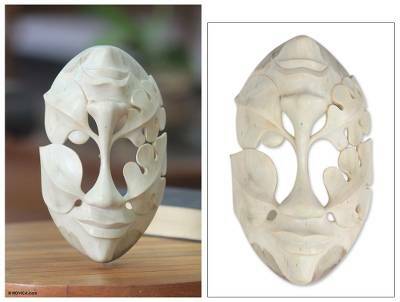 You can find wood mask 'Life's Ups and Downs' by Eka in masks categories such as Leaf and Tree Masks and Wood Masks. Enjoy exploring these sections for other Novica treasures.